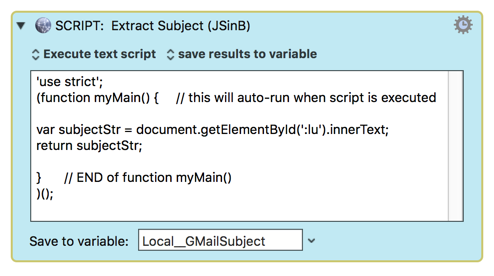 Is there a simple way for me to get email data like Sender, Subject, and Body into Keyboard Maestro variables? For production use, I would prefix each of those with a "var " and put in a function to ensure no conflicts. You will need to test in your setup to see if the web page IDs and Classes will work for you. You may be right, but maybe this will work. That said – if you want to work hard enough it looks like the code is amenable to parsing. How much hard work and how amenable is for the user to discover.